The skull consists of two parts, of different embryological origin—the neurocranium and the facial skeleton (also called the membraneous viscerocranium). The neurocranium (or braincase) forms the protective cranial cavity that surrounds and houses the brain and brainstem. 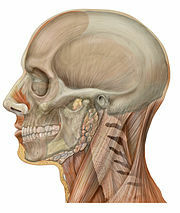 The upper areas of the cranial bones form the calvaria (skullcap). 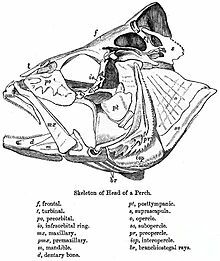 The membranous viscerocranium includes the mandible.